It is a mystery why we deal with time management so badly. This is our commodity which we sell to our clients. However, we treat it like a curse, as if it’s an evil process that accounting forces on us. It somehow escapes us that this is the lifeblood of our business, and without it, we are out of business. So why don’t we manage this better and how can we improve our firm’s practices? Well, to begin with, the timesheet function in Deltek Vision is incredibly easy to use. You just need to know what features to focus on. 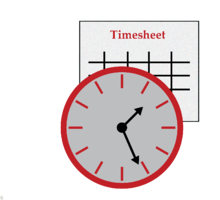 Let’s take a look at timesheets and what is offered in Deltek Vision regarding time management. Project management best practices always include sound timesheet management processes. First of all, timesheets should be entered daily and submitted timely. Secondly, project manager review is mandatory. Timesheets should be corrected before they are posted to our projects and the billing system in Deltek Vision. Poor timesheet management inherently leads to inefficient processes later. Timesheet miscodes cause incorrect project reporting and erroneous invoices. Additionally, transferring time entries in the billing system is time consuming. This slows down billing, involves the project manager, employee and accounting. Worst of all, this directly affects cash flow because of the delay in processing client invoices. Floor Check was introduced in Version 7.2 and is a powerful tool that lets timesheet administrators see if employees are doing their timesheets. It shows the employee’s expected hours and the actual hours entered. Additionally, floor check has email functionality, so you can email employees directly and tell them, “DO YOUR TIMESHEET,” or you can also create pre-defined messages. Unposted Labor Report is a standard project report that only shows unposted time sheets. This is the ideal tool for project managers to use in order to see what has been charged to their projects before they are posted. This is the perfect opportunity to fix timesheets before they are charged to our projects. Project Reports with Unposted Time reports can be included in project reports by using the unposted time option. As a result, project managers can see labor being charged to their projects during the timesheet period. Line Item Approval allows project managers to use line item approvals to put their final approval on time charged to their projects once timesheets are submitted. Line item approvals link to project ownership, so project managers will only see their projects. Timesheet Audit Trail tracks changes to timesheets after they have been saved or submitted. You can require the employee enter a comment, or just track changes without explanation. Audit trails can also track billing transfers. This is the “where did it go” and “where did it come from” report. A timesheet audit trail report is available in employee reporting. With all of these tools within Deltek Vision at your disposal, timesheet management is within your grasp. You can simply start with daily timesheet reminders. Eventually, you will develop a plan that makes timesheet management best practices part of your firm’s culture.